There's nothing more rewarding on a Sunday nite than a new magazine to unwind with, and that's just what I did last night with a copy of the latest issue of Real Living. Always a favorite, this month's issue is their "how to decorate" issue and features practical and gorgeous ideas along with a fun smartphone interactive app (viewa for both androids and iphones) for extra decor tips and tricks. I get my digital copy of Real Living through the magshop app here. I've captured a few favorites for inspiration. (See more after the jump)! 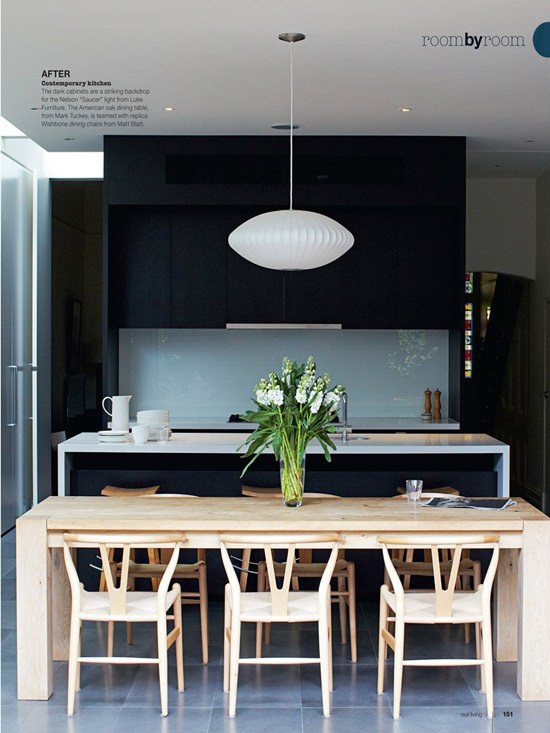 I'm loving the above kitchen combination of black cabinetry with the white counter tops and then the light wood table and chairs. (Above) A display of art combined with a daybed and the mix of industrial lighting and mid century pieces is nice to look at. Editor Deborah Bibby speaks about their new viewa app design guide which is a supplement to this issue which is designed to help you get inspired and thinking outside the box. (One of my favorite things about their magazine). She also mentions there are so many fresh looks surfacing this season - such as schoolhouse inspired by those chalkboards that keep hanging around; natural history, a mix of flora, salvage style, (pages torn from botanical books) and timber (she says think stunning timber boat interiors). Covering up a headboard with a white sheet (and then the same with the bedding) evokes a modern romantic feel. 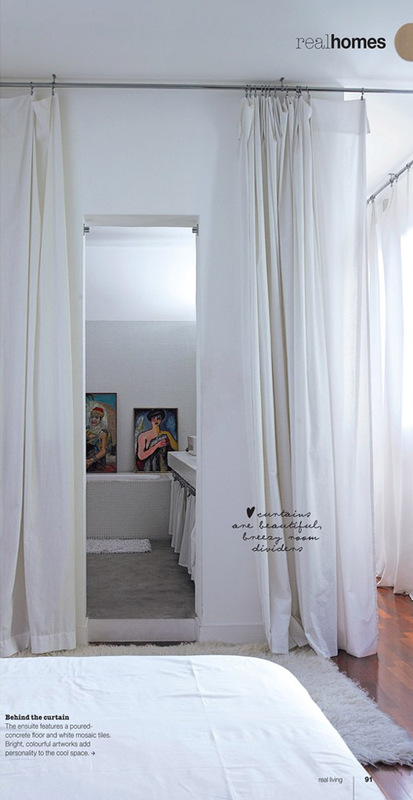 Loving the floor to ceiling curtains (which are used here as room dividers). 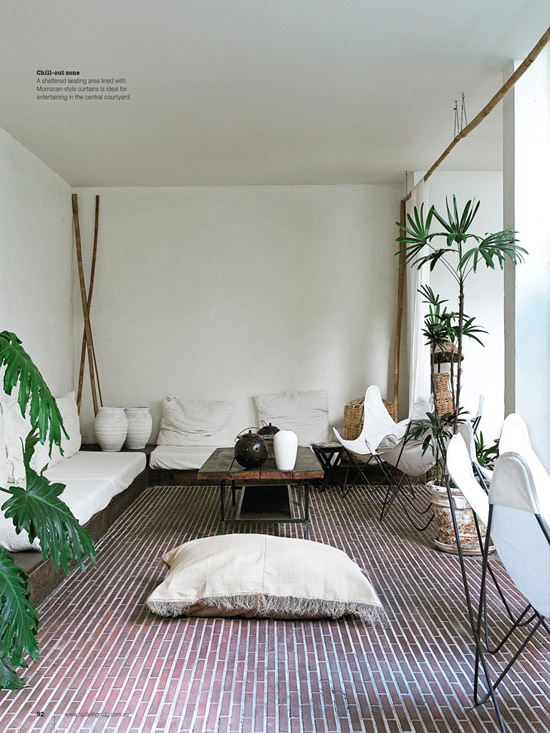 An outdoor/indoor space gets a tropical look with the mix of bamboo and wicker and white. 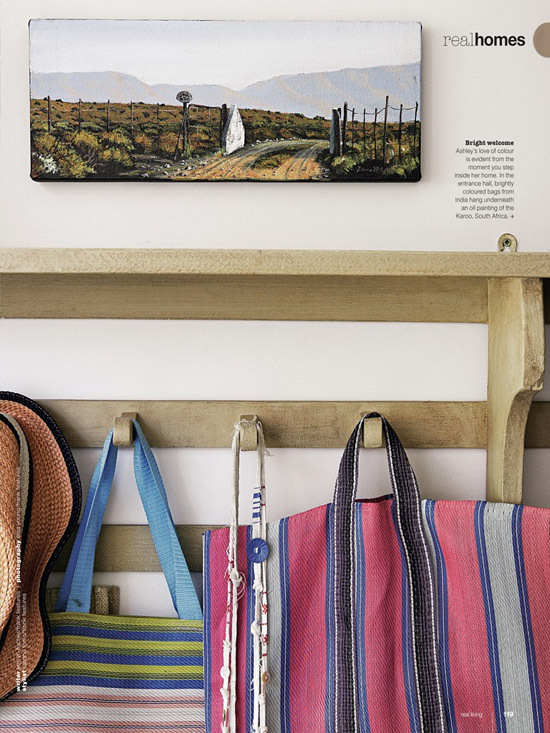 I love this little cheerful coat hanger vignette (with the little painting above). 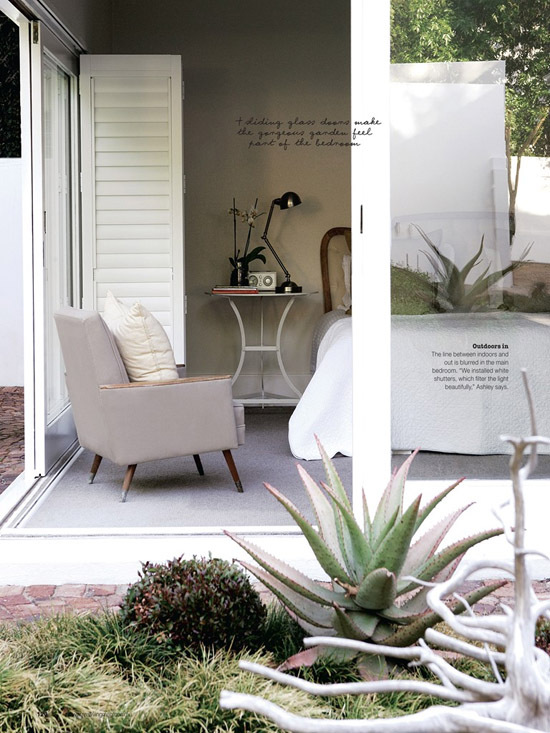 Wooden white shutters will do it to me every time (and a huge aloe vera). 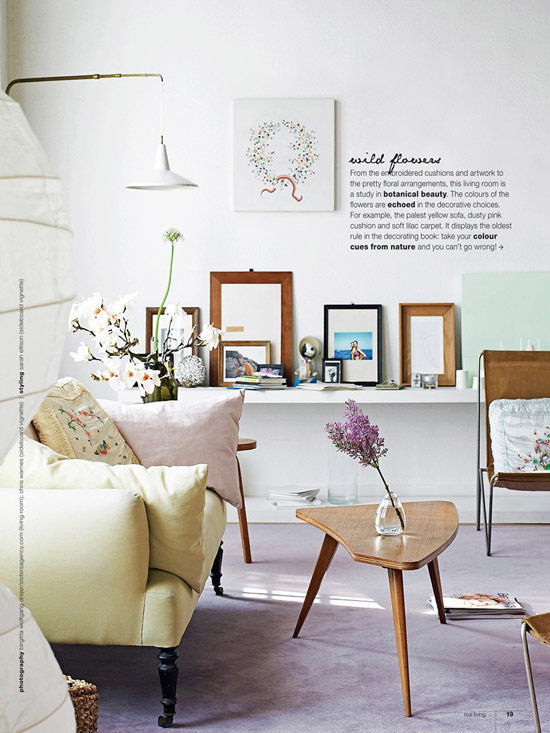 Florals are subtley put here (in the cushions, on the wall) in a pretty palette of pale yellows, pinks and wood. 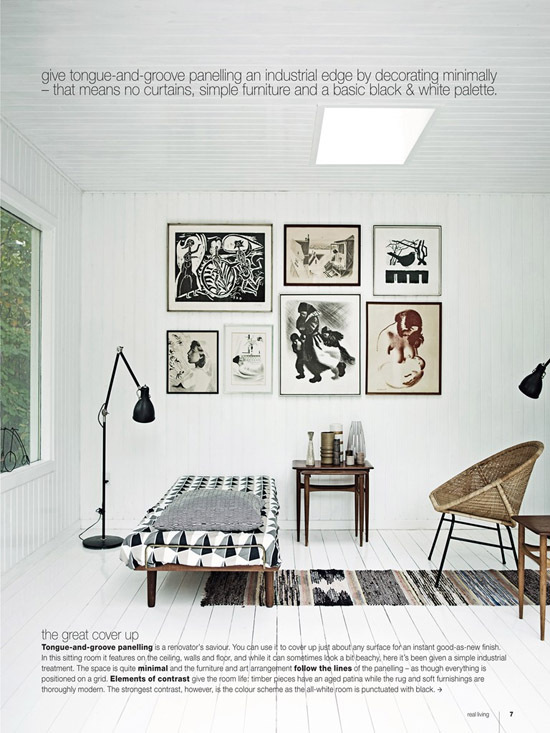 Visit Real Living online here, on facebook and through the magshop app here. Love the outdoor/indoor space... Thanks for sharing. You are doing a great work for us. Unique content and wonderful ideas of post. I love this kitchen. The light wood of the wishbone chairs just pop! I just added these chairs to the loft and love them!